Is there a better example in modern perfumery of how inextricably a name can be linked to the experience of the juice it introduces than Guerlain L’Heure Bleue? 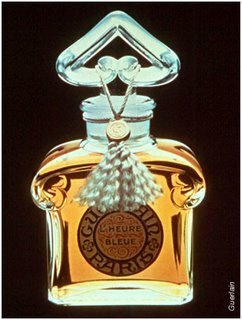 No one can argue with the place of Mitsouko (which, seven year later in 1919, marked the defeat of Germany and the end of World War I) in perfume history, but L’Heure Bleue is another story entirely. Somewhere along the way, it got lost in the annals. It was, and still is, produced but people forgot about it. Or, alas, people never got to know it. It was too quaint, perhaps, in its art nouveau bottle. And with the dawn of the sexual revolution, it didn’t sound the bacchanalian call-to-arms. But, like Chanel No. 5, it contained in part the very DNA of the Guerlain brand; for, at day’s end, people would remember its contemporaneous bedfellows – brainchildren of Jacques Guerlain – Shalimar and Vol de Nuit among them. L’Heure Bleue is not a statement about feminity. It is a form a feminity, if a slightly angular one. It is a poem. It coheres. It communicates an emotion. It holds a secret in its fragile hands – the fragile hands of the evening. When I look at it closely, I see its parts, but like the branches of the trees reaching up into the crépuscule it becomes a unitary thing: the moment frozen and fleeting that we have all experienced and tried to grasp and couldn’t. Beautiful, easeful melancholy in a bottle. It is the Poet’s and his alone. In France, L'Heure Bleue is actually holding its own quite well, actually, judging by the women to whom I teach English in-company. In the Guerlains, it's just behind Shalimar -- which seems to be the Parisian default scent with N°5. (Also showing up in this informal survey: "My mother wears Mitsouko", "My wife wears Jicky", "My GF wears Angel", a couple of YSL Cinéma and the ubiquitous Light Blue). All this to say that classic Guerlains are still very popular here, which is a blessing to my nose. This one works for me very well. Vol de Nuit will always have my heart for classic Guerlains (I haven't decided yet if the gorgeous bottle has anything to do with that). But L'HB is definitely second. D., You have to give the French credit for holding onto tradition within innovation. Chanel No 5 is the most popular example of this, and I'm happy to hear that Guerlain remains firmly ensconced in the French beauty regimen. Especially interesting to me, though, is how this continuity remains despite the changing face of France (new ethnicities, countercultural influences, etc). Just the other day at Bloomingdale's an SA told me her number-one customer for L'HB was a gentleman from Senegal. This is one of Roja Dove's true loves, and mine. He feels that , if it suits you, one wears it as a second, velvety skin. So beautuifully described, dear C.